This summer Mo’s Ferry Prod. 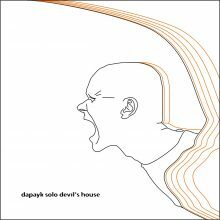 comes up with a new two-tracker by Dapayk solo, announcing the release of his second album „devil’s house“ in late September. The title track is already giving directions for this journey – provided that there’s a proper bass response – „frickelsound“ with affection to the little details and in particular with regards to the bass frequencies. But knowing Dapayk that’s hardly surprising by now 😉 The second one is called „a saw attacks“ – a track like a recapitulation of certain minimal elements that are around for quite a while now. But only the beginning is a typical sportive staccato theme. After a while a full-stereo sawtooth sound and a demoniac vocal sample take the lead, pushed by a strong punchy kick drum and accompanied by a sounddesign of clicks and sweeps.